Drought over past several years is causing a national emergency in Honduras. The drought is caused by climate change, possibly aggravated by El Niño. Without rains in May and June, many families will be malnourished and even hungry. Some family members will be forced to leave the communities to search for city jobs or even to leave the country. In communities that have been in the TCP program for years, improved soil and water conservation practices are providing some protection against the impact of the drought. During a recent trip to Honduras, TCP members saw scattered fields of dead cornstalks. Corn and beans are the staple crops and together are a source of complete protein in the daily diet. Drought reduced the planting done last December. Farming families are now praying that the annual May and June rains will water the seeds planted this spring. Two poor crops in a row will spell severe hardship for all the families and disaster for some. Florentino Amaya told the TCP visitors during their recent visit that the agricultural practices he has learned from Roy Lara are “excellent” because they have helped protect his crops from climate change. Antonio Gamez says that turning the material he slashed down at the end of last year’s harvest makes good mulch and protects this year’s planting. A simple tool made of a wooden A-frame and a plumb line enables farmers to plant seeds in contour lines across the mountainsides to catch and hold the water in the soil. Placing recycled plastic bottles filled with water provides drip irrigation through pin holes in the cap to individual plants with almost no water lost to evaporation. Their fields and vegetable gardens of long-time TCP farming families are now demonstration plots for others. New families are eager to learn these new practices and in some communities farms belonging to new TCP participants are already being used for training. The number one home improvement which the women in the new communities want is a water-conserving sink. Traditional sinks store water in large basins for later use in smaller sinks with drains. Scarcity of water and loss of water to evaporation make these large holding sinks impractical. Both communities depend on water brought to the villages from far-away water encatchments in tubes that have been heavily damaged by fallen trees and mudslides. In one community this public water system delivers water only intermittently and in the other never because it is completely destroyed. In the second community they bathe and wash clothes in the nearby river. Altagracias Pena, like the other women in the village of El Puente, brings water up from the river to cook, clean her home, and water fruit trees and a small garden. She treasures this new water-conserving sink that was built for her by other members of her village, who had learned how to make them from a demonstration by a Vecinos Honduras staff member. After being used and then passed through several layers of gravel and rocks, the filtered water is drained into a nearby family garden. As shown in the photo above, in El Cablotal which receives diminishing supplies of water from functioning water pipes, water-conserving sinks made of recycled tires and cement are valued. No matter what material the sink is built of, the water is used sparingly, filtered, and then drained to water plants. Emphasis on workshops on practices to conserve soil and water will continue during 2016. The specific practices will differ, depending on the needs and wishes expressed by participants in the community. Click to see Conservation Measure and Drought photos. The families with which we have been working in our six communities have now successfully graduated from Sustainable Harvest International (SHI). SHI is no longer working in the Department of Santa Barbara. We will continue the Trinidad Conservation Program work in Santa Barbara, but with a new set of nonprofit partners. As a result, our work with Roy Lara continues, and he has become a part of our new Honduran partner., Vecinos Honduras. This new chapter is exciting for us. First, something about our new partners: Groundswell International has its offices here in Washington, and Vecinos Honduras (Honduras Neighbors), in Honduras. While many of the previous objectives remain intact from our former work (reforestation, “sustainable” agriculture), there are new nuances: an explicit connection is made with environmental awareness at the village level and practical actions that can be undertaken to mitigate climate change in particular, “community led processes”, concern for gender issues, and an emphasis on local determination and self sufficiency. Underpinning all of these is a profound belief in interconnectedness with the environment and others. Here is a bit more about Groundswell International and Vecinos Honduras. Groundswell is an “umbrella” nonprofit: it has affiliate organizations in, among others, Guatemala, Haiti, Ecuador, Mali, Nepal, and Ghana. Its core values are local action leading to global impact by fostering connections, lasting change, agroecological farming, etc. Vecinos continues these values. Steve Brescia, Executive Director of Groundswell, and Edwin Escoto, Executive Director of Vecinos, are exciting, dynamic leaders. Here is a bit about the new program as it is presently visualized. The program, will last for three years (with the possibility of renewal), operate in five communities — three from our original cluster, and two entirely new villages from a neighboring area. The Vecinos methodology will be applied, and participants from the original villages will become “extenionistas” in the new villages. Roy is at present a consultant and has worked with Edwin to frame the start up of a three year project in the municipalities of Chinda and Ilama both of which are near Trinidad, Honduras. We are presently reviewing. a budget and proposal that will cover activities through the end of 2016. In some respects, this seems like another mountain to climb, but we are really excited about the journey. We continue with Roy, our good friend and the villagers whom we have come to love. We have made new friends with Edwin and his staff, and people in the “new” villages. Broadly speaking, the new partnership will work to build alliances among organizations in Honduras and connections with new organizations here in the United States. So, we invite you to share in our excitement about how TCP can continue to empower the rural Honduran poor and help the environment. On March 1st, a small group of TCP members from Capitol Hill arrived in San Pedro Sula and was met by Roy Lara in his family pickup truck. During the next 9 days we traveled many hours and many miles. “We” includes Roy Lara, Betsy and Collie Agle, Mary Procter and Bill Matuszeski — it was a snug fit! One of the reasons for the trip was for us to become more familiar with Vecinos, a Honduran NGO that has sustainable agriculture programs in areas southeast of Tegucigalpa. We were introduced to Vecinos by Steve Brescia of Groundswell International, which is a US NGO that supports sustainability programs around the world. Roy Lara has met Edwin Escoto, Executive Director of Vecinos, several times, and they have been discussing the possibility of working together. The first night we spent in Trinidad. The next day we set out for the Vecinos office in Tegucigalpa,where we were greeted warmly by Edwin Escoto and the Vecinos Board of Directors. Over the next three days we went way far east and way far up to the communities of El Guano and Azabache . What we saw and heard was exciting. 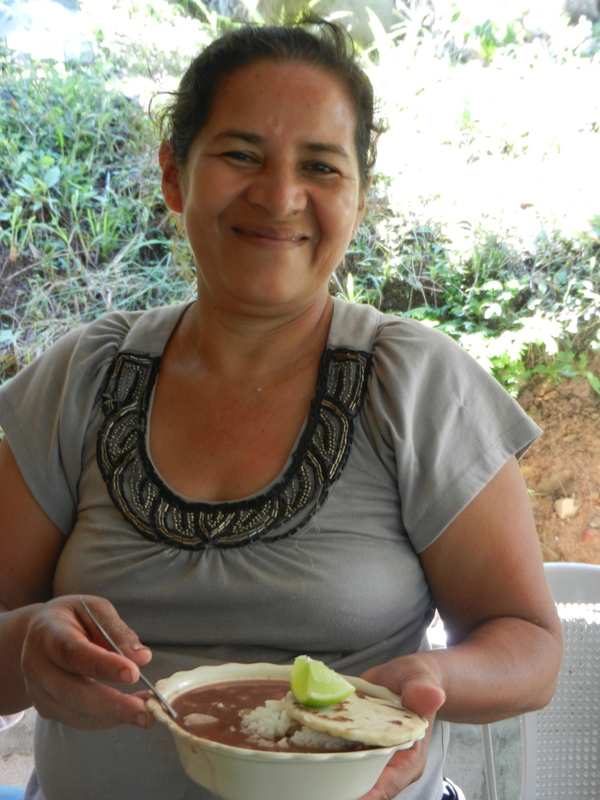 two instances of community organizing: 1) encouraging women to start family planning and to take leadership roles in community organizations, and 2) establishing rural savings and loan banks with initial training and capital loans from Vecinos which is paid back at the end of the year and which diminish year by year as the amount invested from the bank members increases. Everywhere people shared meals made of produce they had grown and chickens they had raised. They were delicious! After returning to Trinidad, we made our way up to the communities of La Majada and El Tule. 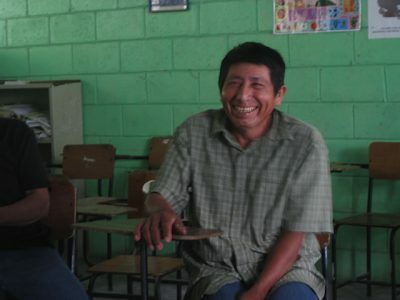 In La Majada we heard testimonials from families about how they are sharing what they have learned from their participation in the SHI program with neighbors and in class rooms. In El Tule, we heard excitement in the voices of the families who told us about a small watershed protection project and the potential for a revitalization of the local rural bank. In both places we passed out beautiful Certificates of Appreciation to all the families. We did feel we had accomplished something important as well. There was clearly rapport between Edwin Escoto and Roy Lara. What will come next is the drafting and adoption of a written agreement of major points for a three way alliance between the Trinidad Conservation Project, Vecinos and Groundswell. Roy will have responsibilities in both the Vecinos and TCP areas. The TCP leadership, including representatives from all the churches, will have a chance to review this agreement before it is signed. Roy will need TCP financial support to continue his work under this agreement. Sunday night we finished off the trip by treating our Trinidad hosts to ice cream from the store on the park. Monday we headed for the airport and bought Roy more than a dozen donuts to take to family and friends. Sweet endings to a sweet trip. High up in the mountains above Trinidad, Santa Barbara, a joyous group of people gathered to celebrate the graduation of 34 farming families from the Sustainable Harvest International five-phase organic farming program. The families came from six villages located on three different mountains: El Tule, La Majada, El Cablotal, El Cerron, El Robledal, and La Laguna Verde. Since July, 2008, the Trinidad Conservation Project (made up of churches and individuals in Washington D.C.has supported the program in these communities. 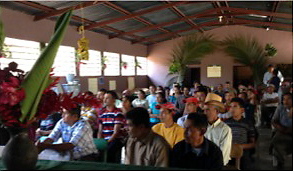 The graduation ceremony and lunch took place in the community center in El Tule. More than 40 people crammed themselves into the space to witness the ceremony. For me, it was a wonderful reunion. The room was filled with the men, women and children I have gotten to know over the past nine or ten years since I have been traveling there. Consuelo was the first one I saw. She is such a wonderful person – generous, hard working, and always smiling! I met her when my church started supporting her church community’s basic grain storage project in 2003. She and her husband Salvador traveled about three hours from El Cerron to be there. Consuelo is a field trainer for SHI now. She and Salvador graduated from the program that day as well. As a field trainer, Consuelo has been teaching women how to prepare, package and market their products, especially plantain chips. Around the room in the community center, farmers had set up stands to showcase and sell their products. There was roasted and ground coffee, pickled vegetables, marmalade, sweet green peppers, plantain chips, and honey. This young woman selling plantain chips came from Laguna Verde. The graduation ceremony started with talks from SHI leaders and local staff. Then the leaders of each community were called upon to speak about their experiences with the program and the successes they have had. The stories from the leaders were very moving, especially the testimony from Maria de Jesus Cortes of Laguna Verde. She spoke from the heart about how her life had been changed by learning how to farm organically and how to market her produce. We all had tears in our eyes when she had finished. After the testimonies, we ate a wonderful, healthy lunch made by the families from their organic fruits, vegetables, and spices, including delicious soy products. After lunch and mingling with our friends, some of us went to Don Virgilio’s house to see his new silos and his vegetable garden. His silos were built with funds provided by TCP to teach farmers how to build silos to store grains safely and to teach others how to build similar silos. I was sad to leave my friends in the TCP communities so soon, but I am very happy to have celebrated with them such a great milestone in their lives. These families have come this long distance in large part because of the financial support from TCP supporters. All of you can rightfully celebrate their achievement as well. Honduras has two problems that have engaged me professionally and personally for well over thirty years: the high rate of poverty that exists in the small rural communities of the country and the continuing destruction of the environment, particularly as it has related to the country’s forests. Previous to my involvement with my friends from Washington, I was working with the Diocese of Honduras in the undertaking of environmental work in small, poor rural communities. My commitment has, for a number of years, been to develop skills, knowledge, and awareness among community leaders in issues such as the protection of watersheds, wildlife, and ecosystems. I also have taught stewardship and the necessity of protecting the environment to students in the local schools. Part of this work was to directly involve the students in the planting of trees in endangered watersheds. My relationship with four Washington churches started in 1987. And we started a joint relationship called the “Trinidad Conservation Project (TCP).” As a result of my relationship with TCP, I joined the staff of Sustainable Harvest International as the lead field trainer for Honduras. I treasure my relationship with my TCP friends in Washington. They have contributed both their time and financial resources to helping six small, rural villages learn good forestry and sustainable, organic agricultural practices. Through on-site visits to the communities over these years; they have developed close, supportive relationships with a wide number of men, women, and children who often feel as if no one cares. And their time and financial resources have made a difference in increasing local vegetable production, improving family nutrition, and empowering these residents. And I also believe that the youth and adult trips have touched and changed my friends from Washington. So, it really is a companion relationship. I am grateful for this relationship for myself and for the countless villagers who have felt its supporting presence. The Trinidad Conservation Project has enabled rural communities around the town of Trinidad, Honduras to address the intermingled problems of poverty, deforestation, and malnutrition. These communities are located in the department of Santa Barbara where nearly half of the population is considered to be malnourished. Many families must make intensive use of very small land holdings. Without help, even the farming families are often hungry or malnourished. Families who are landless suffer even more. 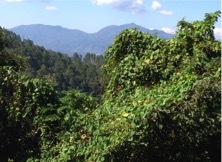 In 2006 TCP started a reforestation project with the Episcopal Church of Honduras to protect water resources. In 2008 TCP teamed with Sustainable Harvest International (SHI) to broaden its impact to include sustainable agriculture as well. No longer tied to destructive slash-and-burn farming techniques, families now care for their fields and crops with compost and other local materials so they can use the same plot year after year. No longer eating only beans and rice, the children are now eating more varied and much healthier diet. After seven years of participation in the SHI program, these families will complete the SHI program in the first half of 2015 and SHI will start its program in new communities in other parts of Honduras. The story of Noé is an example of the transformative power of TCP’s partnership with SHI and the six villages. Despairing of the living conditions and dangers in San Pedro Sula, Noé returned to his village even though he had no land. Participants in the 2009 adult trip were impressed with Noé. When TCP raised the funds to buy land for a half dozen families. Noé jumped at the opportunity to become an owner of about acre of land. The price was sweat equity — it took months to clear the land of weeds and the first harvest, months later, was meager. Three years later Noé has crops to feed his family and small coffee seedlings to sell for cash. His family now lives in small house on the property that he built with help from neighbors and recycled roof material from a church in Trinidad. We know there is still work to be done in these communities. Families are eager to share their knowledge about sustainable farming with others. In some communities the local schools go only to the 6th or 9th grades. The families want more education for their children. The global problems of climate change, unequal access to financial and educational resources, and the current level of violence pose other problems for these farming communities. The Trinidad Conservation Project is a partnership of churches and individuals, in Washington DC formed in 2006 with a common goal to stand by the people of rural communities Honduras. Between 2009 and 2014 we sponsored more than 9 youth and adult trips to Honduras. From these trips we formed bonds. We saw the program made a difference in their lives. 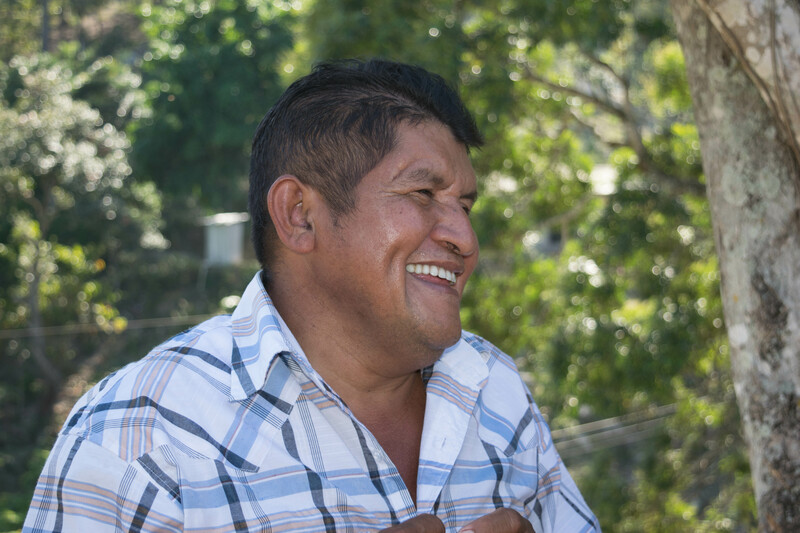 The person who made this connection possible is Roy Lara, a dedicated Honduran-trained agronomist and passionate environmental educator. Before TCP met Roy, he was already working with local public schools in his hometown of Trinidad to build community nurseries. Forests were replanted and students were given seedlings to take home. With support from TCP and SHI, Roy developed the leaders in a half dozen rural communities dedicated and trained to restore and protect forests and farmlands. Roy is an effective field trainer — teaching, motivating, inspiring. As lead trainer and later as lead field trainer in Honduras, Roy also helped arrange meaningful service trips for volunteers from Washington DC. In addition he proved himself an effective spokesperson for the SHI, coming to DC on an annual basis to report on the program. During these visits to Washington D.C., funds were raised and friendships were made and renewed. in his thinking about the future as a result of his working with Roy Lara. 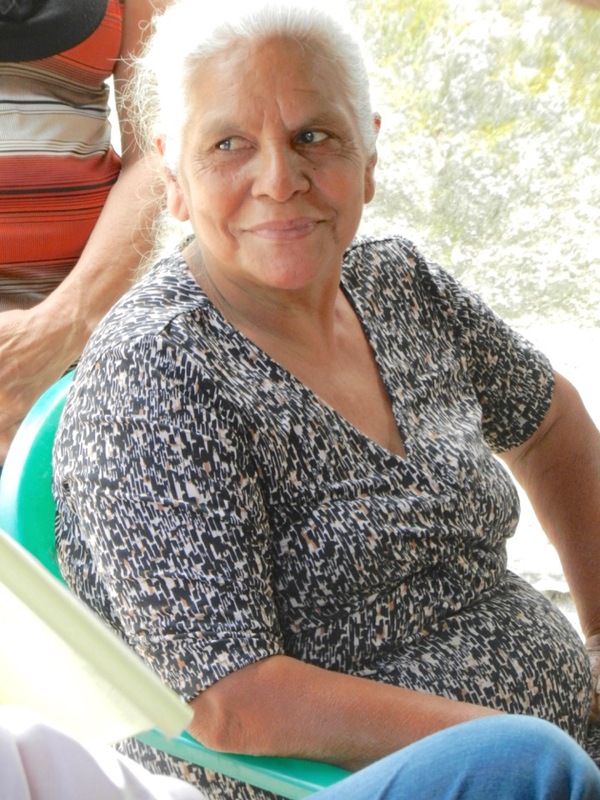 Santos Alaya is from Agua Zarca, a new community in our program. She has been the guardian for generations of a spring nearby which provided water for the community in times of need. Her faith is evident and powerful.